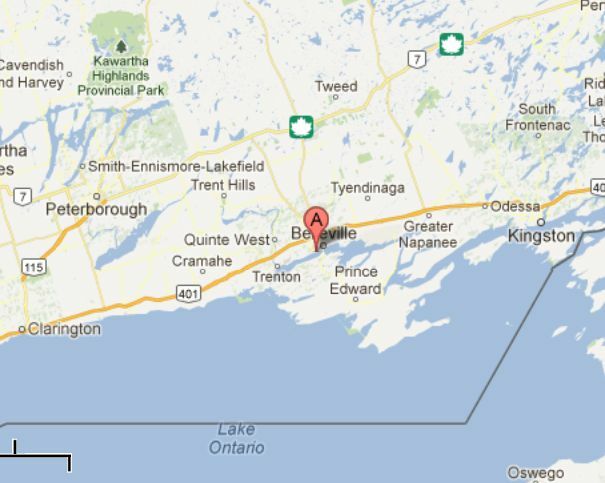 Approximately 30 minutes ago (February 28, 2012) I was driving a tractor-trailer up Hwy 62 north of hwy 7 (the Trans-Canada Hwy) in Madoc, Ontario heading towards Bancroft Ontario. Approximately five minutes up the road I was approaching an overpass above a creek. On the right hand side of the road I saw the dark figure of a person. It wasn’t a person because it was all dark brown almost moose colour and it was very stocky. I saw the profile as it crossed the road and began moving down the embankment moving from west to east. The head was like stuck on its shoulder eliminating the neck and the bicep was thick, should say massive. I was slightly hunched forward approaching this overpass when I saw something looking like it was moving but then as I got about 50 feet from it, it stood still. The trees were 80 to 100 feet from this figure. It might have been about 10 feet off the road and down the embankment but I could see from its waist up. Slightly hunched forward the figure didn’t seem to look at me. Vehicle speed was about 50kms as I was pulling a full load. I have read about sounds about 70kms east of here and tracks and vocalizations north of here near Halliburton, Ontario but I never thought there was anything around these parts of the country. After finding this website, I know I was not seeing things. I will add that I had just started my shift at 5 p.m. that day and the sighting was around 8:40 p.m. at night, so I was not tired. I would estimate the Sasquatch’s height at 7'-8'. It was down an embankment but its head seemed to be a little higher than the road level. Previous sighting: About 10 years earlier it was right around 1:00 a.m. A friend and I were heading west along Hwy 7 between Kaladar, Ontario and Madoc when we saw what we thought was a bear, a huge bear at that. It was on all fours crossing the road from north to south. It turned, looked our way. We were the only vehicle on the road and approximately 500 yards away and I said "that’s a pretty tall bear as it seemed to be 4' tall.” When we got to the spot where it crossed the road, it was gone and this was only three minutes down the road from this recent sighting listed above. I hope info helps. From all I have heard and seen I know now that the Sasquatch exists.